The Houses of Parliament and Elizabeth Tower, commonly called Big Ben, are among London’s most iconic landmarks and must-see London attractions. Technically, Big Ben is the name given to the massive bell inside the clock tower, which weighs more than 13 tons (13,760 kg). The Elizabeth Tower, which stands at the north end of the Houses of Parliament, was completed in 1859 and the Great Clock started on 31 May, with the Great Bell strikes heard for the first time on 11 July and the quarter bells first chimed on 7 September. What does the guided tour cover? An expert ‘Blue Badge’ guide accompanies you throughout this 90 minute tour through the House of Lords and House of Commons. How old is Big Ben? He was cast on 10th April 1858, so he’s 151 years old. Where was Big Ben made? When was Big Ben made? Big Ben was cast at Whitechapel Bell Foundry, in East London, on 10th April 1858. It took him two weeks to cool, and once he was ready, they transported him to Westminster on a horse drawn carriage. Londoners lined the route and cheered as the bell went past. He weighs about 13 and a half tons, about the same as a small elephant. How tall is Big Ben? How wide is Big Ben? 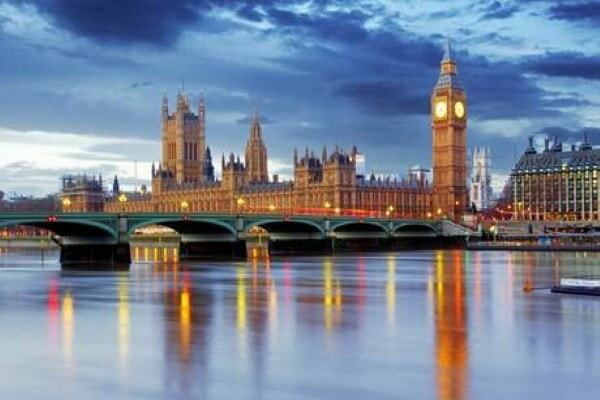 Big Ben is 2.28 metres tall (7 feet six inches) and 2.75 metres wide (9 feet). That’s right — he’s wider than he is tall! How loud is Big Ben? If you’re standing in the belfry when it rings, you can feel the vibration all the way from your head to your toes.